Christians Should “Convert, Pay Tribute, or Leave,” Says Muslim Brotherhood Presidential Candidate? 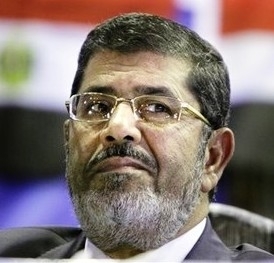 Mohammed Morsi – A slip of the tongue? If this interview is accurate, certainly Morsi would not be the first political Islamist in Egypt to say he wants to see the nation’s Christians subjugated and made to pay jizya (see here for more examples). However, considering that English language media are currently reporting that Morsi is trying to woo Egypt’s Christians and women, to win more votes, it is difficult to imagine that he actually made these comments: one does not doubt that he favors the idea of a “second Islamic conquest” and the subjugation of Christians; one doubts that he would be so foolish as to reveal his mind now, publicly, and thereby jeopardize his chances of winning the presidency. Then again, his remarks are reported in the context of a private meeting at the headquarters of the Brotherhood’s political party. Perhaps a relaxed Morsi thought he was speaking to a fellow Islamist who would not expose him? Perhaps he was annoyed at having to win Christian Copts over and was “venting” for a moment? Stay tuned.